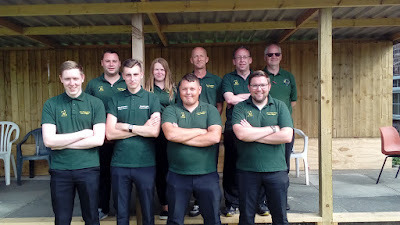 League officials were full of pride after fielding two teams in this year's Shropshire senior inter-league championship in Whitchurch on Saturday 9th June. Just eight teams featured in two round robin groups at nearby Bridgewater earlier in the day, with the top two making the short journey to the semi-finals. Cheryl Caswell, who travelled 51 miles from Cleobury Mortimer to take part, was Mid Shropshire A’s star as they edged an opening group thriller against Whitchurch B by one shot with her 21-14 card at No.8, before two easier wins over Market Drayton and Market Drayton Seniors. upper hand to win by 11 (full scores on the SCGBA website). Mid Shropshire B battled hard on the bigger green at Bridgewater, suffering hard fought defeats against group winners Whitchurch A, runners-up Tanners and North Shropshire Ladies. Happy League officials would like to offer sincere thanks to all the bowlers who took part - and everyone who helped scramble together 2 teams - after some last minute cry-offs - and helped organise and run things on the day. Well done everyone - and thanks again!